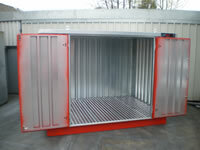 Due to increasing popular demand for larger ‘walk in’ storage facilities, Armorgard have added to their range of TuffStor and FlamStor. Traditionally just available as a fully welded ultra strong design, the new range is both medium duty and collapsible, allowing for positioning exactly where it is required with ease. 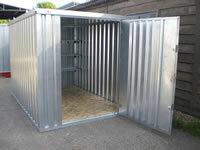 Having sold hundreds of the heavy duty stores into agricultural, local authorities, offshore locations and construction to name just a few, the new range is more suited where perhaps risk is slightly lower, access is more limited or just where budget is restricted. Whereas the FlamStor and TuffStor heavy duty can be made to suit any requirements, the new collapsible version is only available in stock sizes.